While our team at Lice Lifters of Mercer County is dedicated to quickly and professionally ridding your family of head lice for you, we realize you may be a chronic do-it-yourselfer who wants to tackle this problem on your own. If so, you may want to check out the following tips, advice and insight from those of us who know a thing or two about these pests. If you’re a parent, you probably already know that head lice are very small, about the size of a sesame seed, parasitic insects that feed off blood under the scalp. They can’t jump or fly, but they can still spread from one of your kids to another by crawling if they make head-to-head contact such as when playing sports or putting their heads together to pose for a selfie. Because they can spread, you want to treat the problem quickly. Lice shampoos, both over-the-counter and the prescription variety, have toxins in them that can give your child negative reactions. These can include headache, nausea, ringing of the ears, breathing problems and other symptoms. In fact, the main toxic ingredient in some prescription medications is even banned in 52 countries. Also, most lice today have grown immune to these toxins over the years, so they don’t even work anymore. This leaves the natural treatment route for the do-it-yourself inclined individual. This can still be tricky and comes with no guarantees but at least you don’t have to worry about allergic or other reactions to toxic ingredients. One natural approach to getting rid of head lice involves a combination of heat treatment to dry out the lice and their eggs (nits), using a nit comb to remove as many as possible and applying oil to suffocate any remaining lice. A hair dryer can be used for the application of heat step. You’ll want to use it for about 20 minutes total on medium heat. There are nit combs available for purchase for step two above as well as how-to videos online showing proper technique for using it to reduce the chances of missing nits. Coconut or olive oil can be used for the last step above to suffocate the lice. Of course, this step only kills the lice and not nits, so you’ll want to repeat it a couple of times with one-week spacing to kill any recently hatched nits before they can lay new eggs. Also, lice can hold their breath for hours, so you’ll need to put a shower cap on any children you’re treating, and let them sleep with it on overnight. It is possible to attack this problem at home with natural remedies, but you also want to consider that your time is valuable. While home remedies can work, it may take several attempts at such an approach before you’re sure to be rid of all the nits and lice so the problem doesn’t come right back a week or so later. Not to mention the mess and trouble of putting oil or mayonnaise on your kid’s head for many hours. Head lice can be frustrating to the point of making many parents want to simply shave their kid’s head and call it a day. You’ll be pleased to know that going natural doesn’t mean having to go it alone. If you want this problem professionally handled quickly and at a price you can afford, you’ll want to bring any infested family members to Lice Lifters of Mercer County. 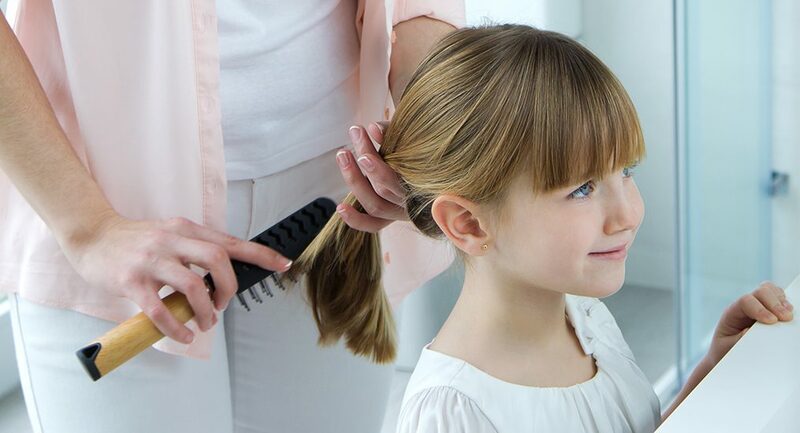 Our certified, compassionate lice technicians can treat all of your infested loved ones at the same time, and using our 100 percent safe, all-natural and non-toxic products, we’ll get them lice free in a single visit.